This Weeks recipe is a super simple mid week meal that is totally delish and a real crowd pleaser. I actually made it last night. By the silence at the dinner table and polished plates I knew it was a winner straight away! Using a food processor fitted with the processing blade, process bread until crumbs are formed. Transfer to a large bowl. Add parsley, chives, thyme, garlic. Process on speed 3 until finely chopped. Add breadcrumbs and cheese. Process until combined. Season with salt and pepper. Place flour in a bowl. Whisk egg and milk together in a bowl. 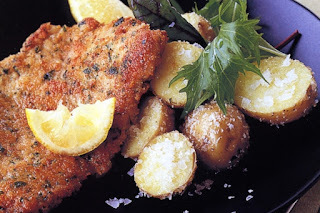 Coat veal lightly in flour. Dip in egg mixture. Lightly coat in breadcrumbs. Heat oil in a large fry pan over medium-high heat.Cook veal in batches for 2-3 minutes each side or until golden and cooked through. Serve with crispy potatoes and a mixed salad.